Discus fish have been kept in aquariums since the 1920′s. For many, they are considered the “kings and queens” of the tank. Their unique shape and bright patterns and colors have brought the spotlight of attention to wherever they might find themselves. Discus fish are part of a large group of fish know as cichlids. In general, cichlids are freshwater fish that come from the Cichlidae family. Approximately 1,500 or so cichlid species have been identified. That makes the Cichlidae the largest family of vertebrates. And, it is possible that there could be many more cichlid species in the world, some of which have not yet been discovered and identified. It is quite interesting to note that cichlid sizes range from as small as one inch to as large as 36 inches. Their shapes also vary: some are laterally compressed while others are elongated and cylindrical. They are mostly found in freshwater, although some can tolerate short periods of being in brackish or saltwater. Discus happen to be just one of the 1500 cichlid species. Their scientific designation is the genus Symphysodon. There are three know species of discus. They are Symphysodon aequifasciatus (common discus, also identified as green discus), the Heckel discus (Symphysodon discus), and Symphysodon haraldi (the blue/brown/common discus). Discus are somewhat similar in appearance to the genus Pterophyllum, which includes angelfish, because they have a round, laterally compressed body shape (hence the name “discus”). But the discus does not have extended fins like you find in angelfish, and the shape of the discus is definitely more rounded. 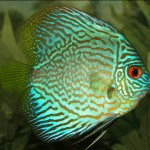 Discus are usually quite colorful, sporting shades of red, green, brown and blue. There are also frequently patterns of stripes or spots, leading to names such as “leopard” or “snakeskin”. Normally, you will purchase discus that are about 2.5″ in height and width, however, full grown discus can be 6″ to 8″ in height and width. Discus fish call South America home. Unless they are in an aquarium, you will not find them in any other part of the world. Specifically, they populate the Amazon River basin and its tributaries. Now, that may seem like a limited habitat, but remember that the Amazon is the longest river in the world. So there is plenty of area for discus habitation. In their original surroundings, they live in very muddy water with lots of vegetation. Over the years, discus fish have gotten some bad press. This may or may not be deserved. One camp suggests that discus fish are very difficult to keep, while another says that they are not. Truth be told, discus fish are not any more difficult than other species if you have the knowledge of what will make them happy and healthy. If you are thinking about adopting discus fish, make sure you know enough BEFORE you bring them home… later may be too late. What Do You Feed Discus Fish? Discus Fish Water – Is Yours Safe?